I'm toying with the idea of writing a book about statistical analyses of classic games. The target audience would be mathematically interested laypeople, much like Jeffrey Rosenthal's book Struck by Lightning ( https://www.amazon.ca/Struck-Lightning-Jeffrey-S-Rosenthal/dp/0006394957 ). The twist would be that chapter would contain step-by-step R code or Python code so that the reader could do the same analysis and make changes based on their own questions. Material would like this post on Bingo, as well as my previous post on Snakes and Ladders ( https://www.stats-et-al.com/2017/11/snakes-and-ladders-and-transition.html ). There would also be some work on chess variants, othello, poker, and possibly go, mahjong, and pente. Tied to each analysis could be light lessons on statistics. This Bingo analysis involves Monte Carlo style simulation, as well as notes on computing expected values, CDFs and PDFs. 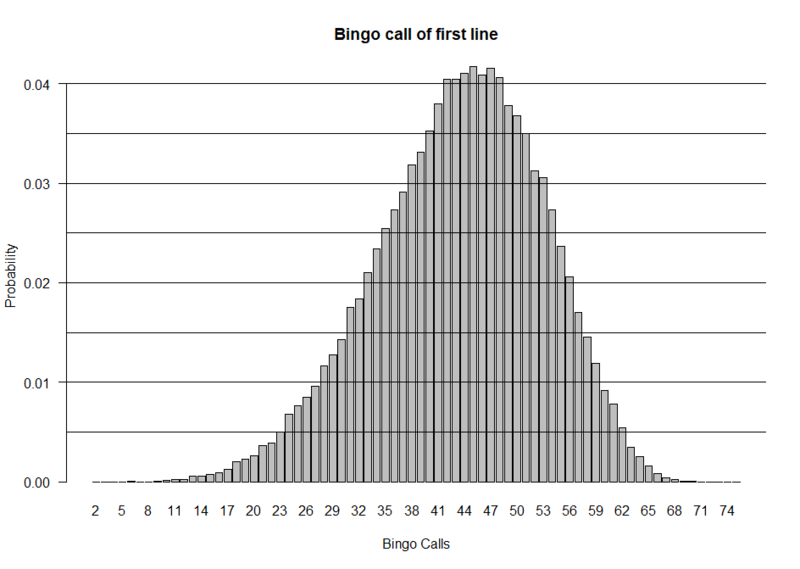 ### Bingo is all about lines, so first let's make a function that checks for the lines on a bingo card. ### There are 12 lines in a standard 5x5 bingo card: 5 rows, 5 columns, and 2 diagonals. ### Then convert it to a 5x5 matrix. ### If it's already a 5x5 matrix when input, this shouldn't change anything. ### For each row, check if all five dabs have been gotten. ### If even one in the row is missed, return FALSE for that line. ### For each column, check if all five dabs have been gotten. ### Set the 12 TRUE/FALSE answers for the 12 lines as the function's output. ####### Now let's scale this up! ### ... number of lines after C dabs on the Rth bingo card. ########## Now let's check our work. ### Check 1: Are all 12 lines included after 25 dabs? Every time? ### Check your work. Are there 0 lines in the first 4 dabs? Every time? ### Check your work. Are the number of lines always the same or decreasing? #### Since everything seems to be working, let's do some analysis. 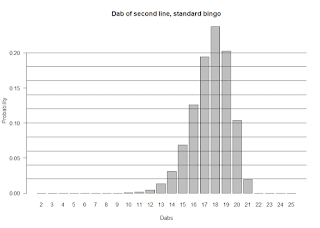 ### Probability of getting first line by nth dab. sum(1 - CDF) ### Answer: 13.8969 dabs to first line. ###### Analysis 2: What if you need two lines? ### Analysis 3: What if you wanted to know about two specific lines, like the diagonals? ### How many dabs until you could expect an X? ### Let's go back to the output of checklines. lines_so_far gives total number of lines, but not which lines. ### The diagonals are specifically the 11th and 12th lines being checked, so we can modify our Monte Carlo simulator to get those. ### The results look like the lines_so_far results, but only two of the lines count. ### What if you couldn't dab all the time? That's what adulthood is like. 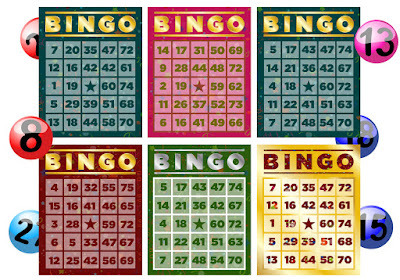 ### In a real game of bingo, there are 75 numbers called. ### Instead of looking at number of dabs until a line is found. ### Let's investigate how many numbers need to be called instead. ### For this, we run the simulation again with three changes. ### 1) We generate a random ordering from 1 to 75 instead of 1 to 25. 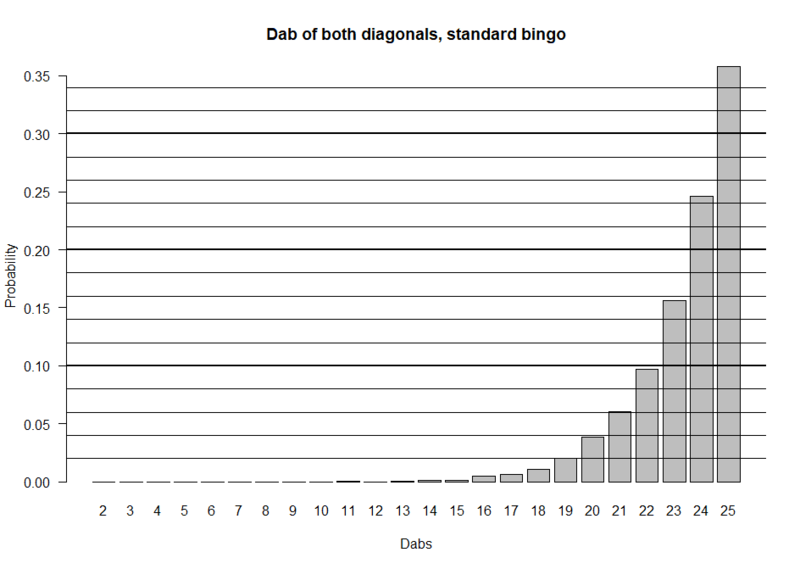 ### 2) Only the numbers 1 to 25 are used as bingo dabs. The rest provide no dabs. 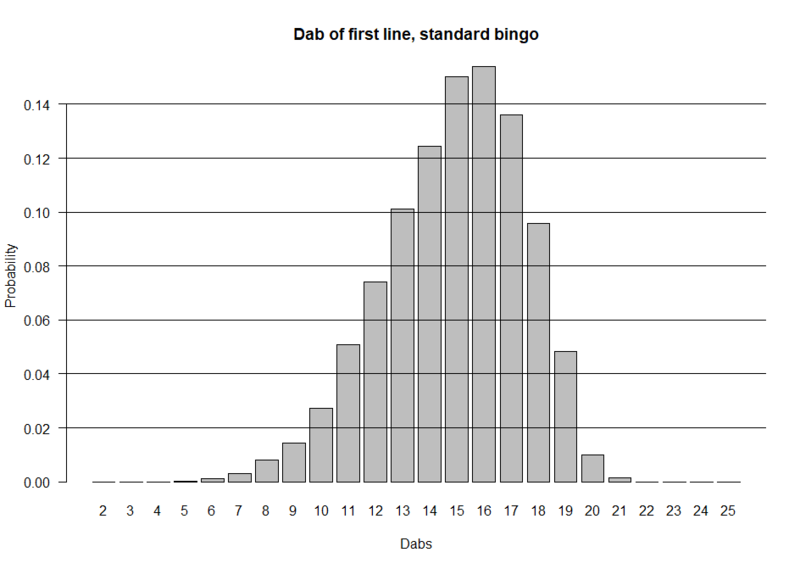 1) In Bingo, The first column 5 numbers from 1-15, the second column from 16-30 and so on. Does this change anything in the simulation or analysis? 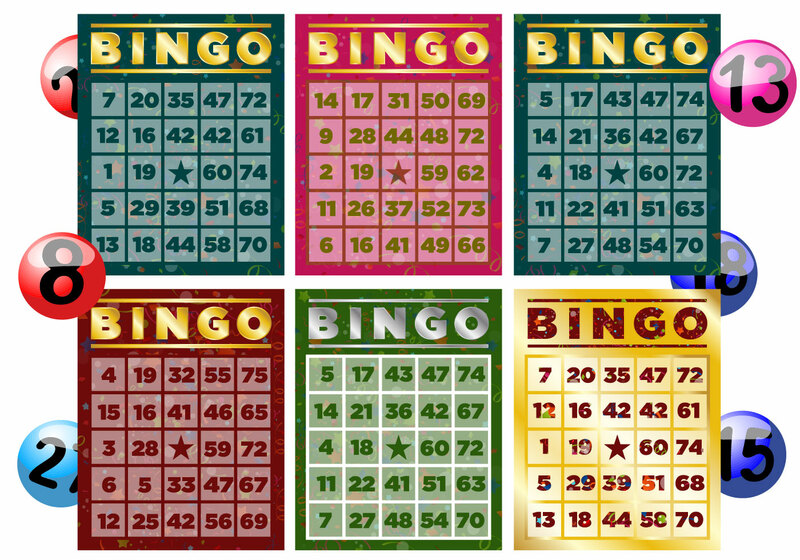 2) In Bingo, sometimes the middle square [3,3] is given for free before the game starts. What does this change coding-wise? Results-wise? 3) In Analysis 4, checklines is called even when nothing has changed on the bingo card from last call. How would you improve the efficiency without changing the result? 4) Standard Bingo is played on 5x5 cards. 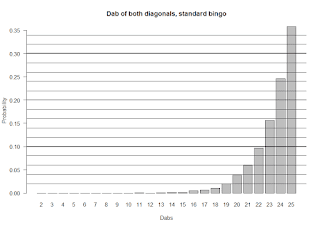 What changes would be needed to the code to make this work for an arbitrary bingo card size?